An eclectic collection of mixed media. Shematria is a dedicated biblical gematria calculator. Type in Hebrew, Greek or Roman or look up a number. Look up bible verses in Hebrew or Greek. ‘The Book of the Law’ by Aleister Crowley, now searchable. Letter Symbolism and Merkavah imagery in the Zohar’ by Eliot R. Wolfson. This track from episode 29 is from the Living Thelema series by Dr. David Shoemaker. This particular segment is about Cognitive Therapy for Magicians. This is an excellent video lecture by ‘Divine Prospect’ (Ron Shields). Discusses the work of Professor Douglas Petrovich as he traces the migration patterns of the Israelite people through the ancient near east. Have a note book handy because DP gives you a lot of work to go and research for yourselves afterwards. One of the most comprehensive lectures on the Orch OR theory of consciousness to date. It was held at the Moscow Center for Consciousness Studies in October 2016. “The Visions of Aleph” by Doctor T. (1797)‎. Published in ‘The New York Magazine, Or Literary Repository’. 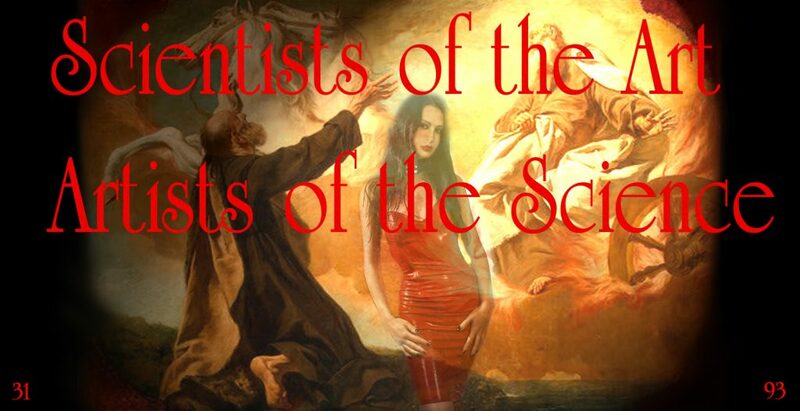 – has an impressive collection of reproductions of the original works of Aleister Crowley. Origins of the ancient constellations: The Mesopotamian Traditions. By John H Rogers. A personal explication of the Thelemic Qabalah, by Soror N.’.O.’. The Ancient Egyptians used a Sirian Year of 365.25 days which was neither the Tropical year of 365.242, or the Sidereal Year of 365.256 days. We explain the manner of discovering this unique astronomical cycle and go through some ideas about Sirius as a neighbor star to the Solar System. “The fact is that Sirius is the only star in the night sky that is not affected by the precession of the equinoxes as the rest of the stars are. The Egyptians would signal their New Year’s Day when Sirius became visible again after about 70 days of absence in the night sky. As the Sun moved through the neighboring Zodiac constellations of Gemini and Cancer, Sirius would not be seen because of the bright sunlight in front of it by day, but as soon as the sun advanced around the year and entered Leo, Sirius became visible again. On the day when it became visible again, it would rise at morning right before the Sun in what is known technically as heliacal rising. [Podcast] from the Washington James Information School on the text ‘The exhalation of Inanna’. Sumerian is the first language for which we have written evidence and its literature the earliest known. The Electronic Text Corpus of Sumerian Literature (ETCSL), a project of the University of Oxford, comprises a selection of nearly 400 literary compositions recorded on sources which come from ancient Mesopotamia (modern Iraq) and date to the late third and early second millennia BCE. Hebrew Union College Annual, vol. 58, 1987, pp. 157–225. Cultural Borrowings and Ethnic Appropriations in Antiquity, ed. E. Gruen (Stuttgart: Franz Steiner Verlag, 2005), pp. 23-36. Dhamma Talks, by Luang Por Munindo. Weekly readings for the Aruna Ratanagiri Buddhist Monastery, Northumberland, UK. Translations of the Zohar: Historical Contexts and Ideological Frameworks, Boaz Huss. The Zohar, a compilation of Kabbalistic texts which were written in the late thirteenth and early fourteenth centuries, was bestowed an authoritative and sacred status in many Jewish communities. Together with its central role in Jewish culture, the Zohar stimulated considerable interest in Christian Kabbalistic and Western esoteric circles. In recent years, a newly awakened interest in the Kabbalah and the Zohar has been evident in many circles both in Israel and all over the world. The interest in the Zohar stimulated its translation into different languages, each created according to different motivations and within diverse theological and ideological frameworks. This article offers a review of the history of translations of the Zohar and discusses the historical contexts and ideological frameworks in which these were created. 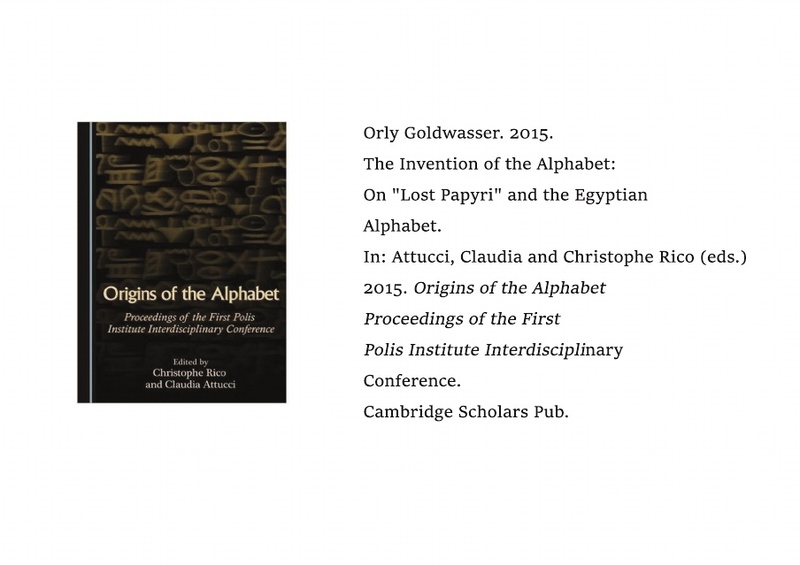 Origins of the Alphabet, by Orly Goldwasser 2015. Cultural and Religious Impacts of Long-Term Cross-Cultural Migration Between Egypt and the Levant, in Journal of Ancient Egyptian Interconnections 12, 2016, 50-88. [Pdf] ‘Faces of the Chariot’ by David Halperin. The Circulation of Astronomical Knowledge in the Ancient World. Text and Context in Biblical Studies A Brief History of a Troubled Relationship, by Steven Weitzman. 2016. Sass B. Aram and Israel during the 10th–9th centuries BCE, or Iron IIA. The Alphabet. In O. Sergi, M. Oeming and I.J. de Hulster eds. In search of Aram and Israel. Politics, culture and identity (Orientalische Religionen in der Antike 20). Tübingen, 199–227. from its paleo-Hebrew beginnings to the Futhark Runes of Northern Europe, by Judith Dillon. Elusive Scrolls: Could Any Hebrew Literature HaveBeen Written Prior to the Eighth Century BCE? (2016) The Early History of the Alphabet: An Open Response to Christopher Rollston, by Douglas Petrovich. The Early History of the Alphabet and the Recent Claim that the Northwest Semitic Inscriptions from Serabit el-Khadm and Wadi el-Hol are Hebrew: Spoiler Alert, They’re Not. by Christopher Rollston. Between “Realia” and “Exegetica” – Israel Finkelstein/Thomas Römer. Tag Line: “How do you know what you think you know? A man narrates his personal deconstruction of his reality as he journeys to an audition to discovers that he is an actor auditioning for the film he is already in. The Hebrew Names of the Seven Planets, by Robert R. Stieglitz. Biblical, Archaeological, and Egyptological Perspectives on the Exodus Narratives. A comparison of the Seven Seals in Islamic esotericism and Jewish Kabbalah, by Lloyd D. Graham. Biblehub – for all your interlinear necessities – featuring topical, Greek and Hebrew study tools, plus concordances, commentaries, dictionaries, sermons and devotionals. Jacob-El in the land of Esau and the roots of biblical religion, by Israel Knohl – Yehezekel Kaufmann Professor of Bible Studies, The Hebrew University, Jerusalem. Why the Golden Dawn is Closer to Martinism than You Think And the Key to the Third Order Diagrams of the Golden Dawn, by Samuel Robinson, July 2017. 90 books, pamphlets, documents, conferences, letters, etc. including the Sepher Bahir, The Egyptian Book of the Dead, and the Magical Ritual of the Sanctum Regnum. Evil and the Disruption of Order: A Structural analysis of the Acrostics in the First Book of Psalms, by Ronald Benun. “Stellarium is a free open source planetarium for your computer. It shows a realistic sky in 3D, just like what you see with the naked eye, binoculars or a telescope.” It is being used in planetarium projectors. Just set your coordinates and go. The International Collection of Digitized Hebrew Manuscripts. “With the rapid advances in the technological environment that significantly expand options for preservation, presentation and access to digital content, the National Library of Israel initiated the renewal of its collection of copies of Hebrew manuscripts. This enterprise, undertaken in partnership with the Friedberg Jewish Manuscript Society (FJMS) is designed to make Jewish manuscripts widely available. The International Collection of Digitized Hebrew Manuscripts will enable global centralized digital access to the complete corpus of existing Hebrew manuscripts. The images will be preserved long-term using state of the art technology, and the collection will be accessible to international communities of researchers and users from the comfort of their own institutions and homes. Author Bio: Henryk Drawnel is Professor of Second Temple Literature and Jewish Studies in the Biblical Studies Institute at the John Paul II Catholic University of Lublin, Poland. His published works include articles and monographs on the Qumran Aramaic texts, including An Aramaic Wisdom Text from Qumran: A New Interpretation of the Levi Document (Brill, 2004) and The Aramaic Astronomical Book (4Q208-4Q211) from Qumran: Text, Translation, and Commentary (Oxford, 2011). Zodiac mosaics in ancient synagogues. Reader’s Guide to Judaism – See page 457! A concise set of notes on Gematria, the Merkabah and the Torah. Who Maketh the Clouds His Chariot: The Comparative Method and the Mythopoetical Motif of Cloud-Riding in Psalm 104 and the Epic of Baal, by Jordan Wesley Jones (2010). Alleging parallels between Scripture and other ancient Near Eastern texts has always been a matter of controversy. The controversy has resulted from criticism of the comparative method by those who accuse its users of being overly simplistic or reckless when applying their particular approaches to the texts. This recklessness has resulted in alleged connections that are now considered very loose, unjustified, and harmful to the context of Scripture. 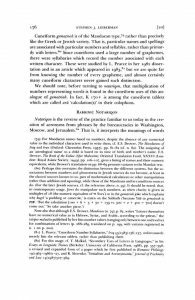 In order to avoid the dreaded “parallelomania” that has resulted from hasty conclusions in comparative studies, it is necessary to approach alleged comparative units in a more concrete fashion, synthesizing the best of past approaches and cautiously utilizing those approaches when arriving at conclusions. The comparative element under discussion in this paper is that of divine cloud-riding, and the texts under consideration are Psalm 104:3 and the Ugaritic Epic of Baal. Both the Hebrew Bible and the Ugaritic texts describe Yahweh/Baal as a rider of the clouds. The mythopoetical motif of cloud-riding can be seen in many ancient Near Eastern texts where a storm god races through the heavens on his or her angelic cloud-chariot. This is true also of portions of the Hebrew Bible that describe Yahweh as one “who makes the clouds his chariot, who walks on the wings of the wind” (Ps 104:3). Since Ugarit is, in literature, Israel’s most significant Canaanite neighbor, it becomes a matter of interest when Baal is called repeatedly “the Rider of the Clouds” in his respective texts. Is there a legitimate parallel between the Yahwistic motif of cloud-riding and the northern Canaanite expression “Rider of the Clouds”? If so, what is to be made of this parallel and what were the psalmist’s intentions by including Baal-like language in his description of Yahweh? The Brazen Serpent by Helen Kirby. A website about Grady Louis McMurtry’s branch of the Argentium Astrum.